Looking for a total body workout but you're on a budget? The refurbished Bowflex Ultimate 2 home gym is a total-body workout solution that delivers everything you could possibly imagine for great fitness results. It offers over 95 exercises and includes a lat tower, leg extension/leg curl station, preacher curl attachment, integrated squat station and more. 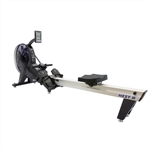 Other features include 310 pounds of Power Rod resistance, a no-change cable pulley system, built-in cardio rowing machine, and 5-way hand grip/ankle cuffs. This refurbished model of the Bowflex Ultimate 2 is backed by a full 6-month warranty. Bowflex's patented Power Rods, which provide resistance, or weight, that feels as good as or better than free weights--but without the inertia or risk of joint pain usually associated with free weights. You can hook one, two, three, four or all of your Power Rod units to the cable pulley system and go from as little as 5 pounds all the way up to 310 pounds of resistance (can be upgraded to 410 pounds). They're precisely manufactured from a high-tech composite material under the highest quality control measures, then sheathed and tested 4 separate times to ensure quality and durability. The Power Rod units are so strong, you can flex them repeatedly but you won't be able to wear them out. Workout area: 9' 4" x 6' 6"
Folds to a compact size (44 by 46 inches); recommended workout area of 9' 4" x 6' 6"
Was expertly remanufactured, no dings, and working like new. It weighs 600 lbs off the truck, be prepared to have some big guys help move it. Loved the sharpie Bowflex art on the red plastic shipping wrap. 100% satisfied.